Intel's CEO Paul Otellini has moved to reassure investors that the company's new range of low-power processors mean Intel has nothing to fear from rival ARM. Speaking at a analysts' meeting yesterday, Intel's chief executive officer claimed that ARM's reliance on licensing its ultra-low-power processor designs to other manufacturers is actually its biggest weakness. TechEye quoted Otellini as stating Intel has "been there, done that", and that its profit margins on its home-produced processors were far higher than the industry average for foundry-produced chips. Otellini's comments come as Intel launches its Moorestown low-power processors, aimed directly at ARM's stronghold: the smartphone and embedded device marketplace. With Otellini singling ARM out amongst its competitors for special comment during the meeting, it's clear that he is confident that the Moorestown - which will be sold as the Atom Z6xx series - processors could finally spell the end of ARM's dominance in the smartphone sector. 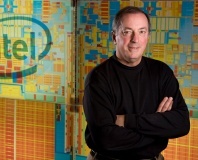 In another dig at non-x86 rivals, Otellini stated that "the architecture which is the most popular on Earth is getting more popular every day," stating that Intel shipped 3.3 billion 'processor cores' in the first quarter of this year - although he didn't specify whether that figure was for literal cores or individual processors. One thing is for certain: Intel isn't willing to concede the smartphone sector to ARM without a major fight. Do you believe that Intel has a chance with its new Moorestown chips, or is Otellini kidding himself - and investors - if he thinks he can beat ARM in its strongest sector? Share your thoughts over in the forums. Intel's CEO has claimed ARM will go the way of VIA and Transmeta. 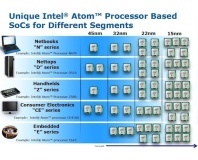 Intel has unveiled a roadmap that forecasts 22nm and 15nm Atom chips.